Lather up in some style! 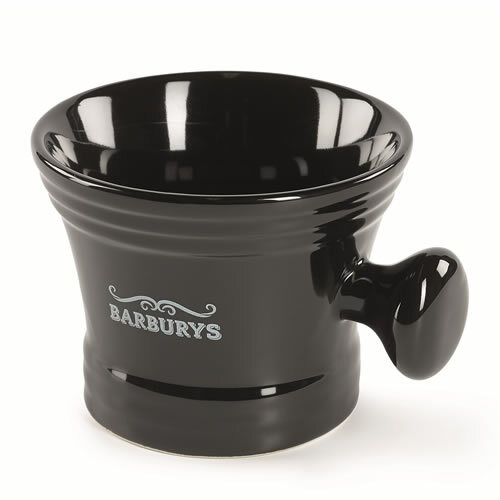 The Barburys Garibaldi Shaving Mug is a great-looking porcelain mug with a large, user-friendly handle and attractive finish. Would look good in any barbers or salon. Available in a smart black design emblazoned with the Barburys logo. £7.91 (inc. VAT) Why no VAT? We're a trade wholesaler and quote our prices without VAT to help our VAT-registered customers understand the true cost of a purchase. Handmade from thick, waxed canvas for a wonderful vintage look with comfy shoulder straps and plenty of loops and pouches. Available in 4 colours: Chocolate Brown, Dark Charcoal, Denim Blue and Desert Sand. Clean, white porcelain shaving bowl that adds a touch of class to the wet shave experience. It has a 12-cm diameter and stands at 5.5 cm. Strong, vintage-look case cleverly designed with loops and compartments to keep all your kit secure and organised. Measures 40 cm x 27 cm x 15.5 cm. Exceptionally high quality shaving brush made from the softest and most flexible badger bristles. Wide design (25.5-mm diameter) for optimum water retention to build a rich and luxuriant lather. Stylish appointment book that's perfect for barbers operating with 3 stylists. Features 164 pages split into 3 columns and 15-minute time slots. Luxurious shave cream with hydrating aloe vera and soothing jojoba extract to deliver an outstanding shaving experience. Comes in a 125-ml pot. Cooling sticks or styptic matches designed to soothe razor burn after a wet shave. Simply tear off a stick and apply the end to the irritated skin for instant relief. Available in single packs of 10 or a display box of 48 x 10. Made with aluminium sulphate, this styptic pencil is designed to quickly staunch blood from shaving nicks or razor cuts. Comes in a resealable perspex container. Softening shaving cream designed to cater for wet shave clients with a sensitive skin. Softens facial hair and helps your razor glide across skin. Comes in a 1-litre pump bottle. Traditional shaving soap made with naturally antiseptic and astringent potassium alum (Alum) and moisturising shea butter. Beard shaping tool for keeping neck lines, cheek lines and goatees in perfect shape. Makes a great retail product. Available singly or in a retail box of 12. Stylish brown apron with multiple loops and pouches for your barbering tools and a soft touch, leather-like appearance and feel. Measures 80 cm x 65 cm.